We didn't do a whole lot of paper snowflake cutting this year (no worries, we always have lots of snowflakes to hang) but we did try something new. I came across the idea on tumblr and found the instructions here. 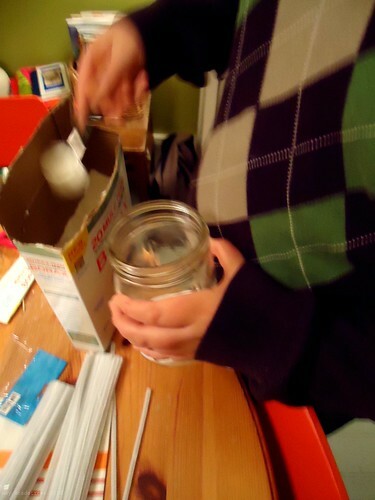 We put this project together quickly and easily, using a few simple tools and household products. container with mouth at least 4" wide or so. We used wide-mouth Ball jars. Gather all your supplies. 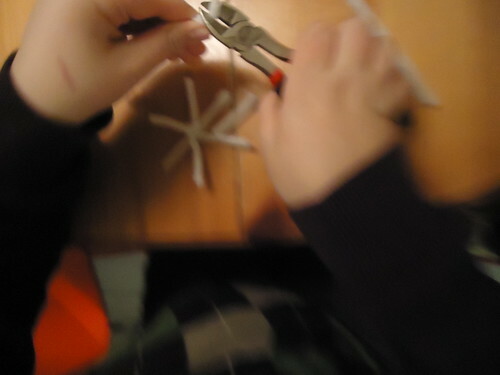 Then cut a single pipe cleaner into three equal parts. Twist the three pieces at the middle together to form a six-pointed star. After completing your star shape, attach a piece of wire or twine or yarn to one of the star points and attach the other end to the sturdy stick. The stick needs to be cut just long enough to rest across the top of the container without falling in. Hang your star shape from the middle of the stick. Place star shape into the container. The shape should be not touching or just touching the sides, but not the bottom of the container. 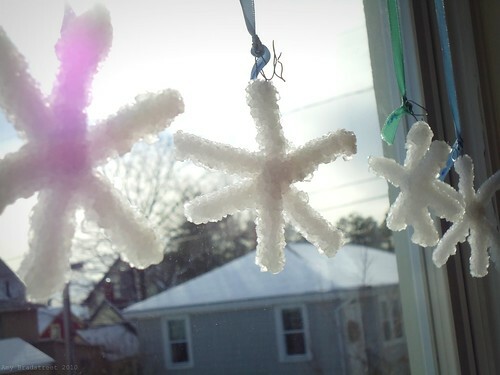 Only one snowflake per container. 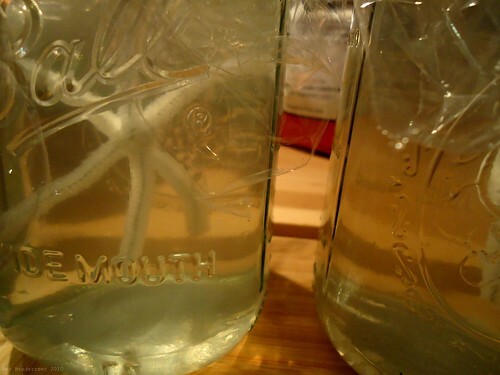 Each jar gets 9 Tbsp of Borax. Your final step is to add the 3 cups of very hot (or boiling) water--we used our electric kettle for this job--pour the water into your container slowly. 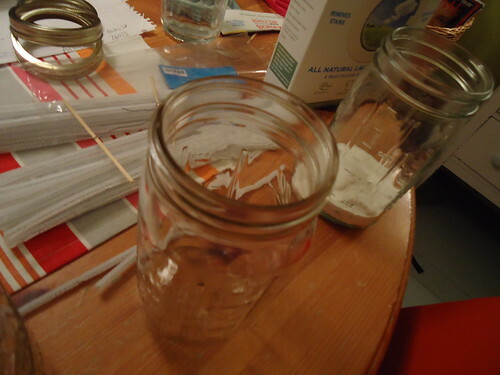 We covered the tops with plastic, labeled our jars and set them aside. 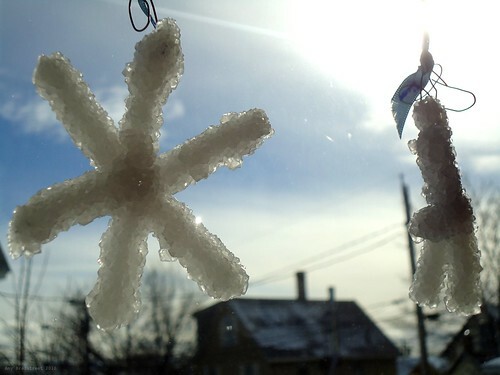 Within hours, crystals began to form. 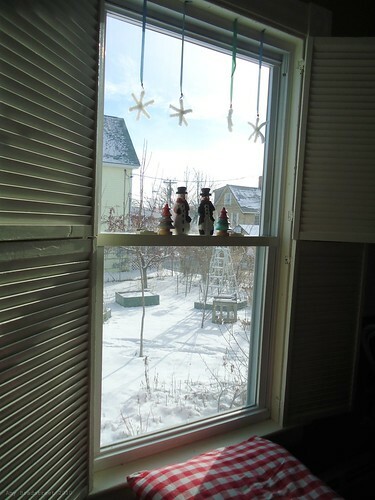 The next morning, with a little coaxing out of the jars, we removed the snowflakes. 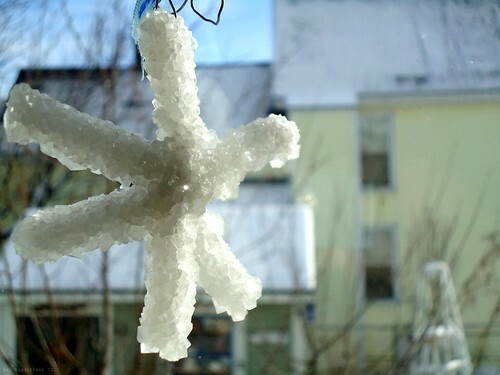 We had such fantastic results and it was such an easy project, that I think we'll definitely add this to our snowflake making tradition. 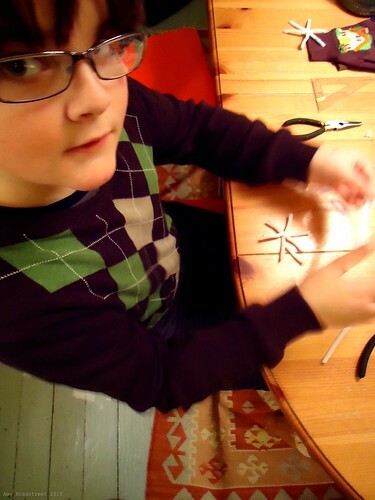 Here's a guide for cutting paper snowflakes. LOVE these! I think we'll make them in my earth school! Great Marcia! They are so fun and simple to make. Amy. What a cool project! Wishing you and your family health, happiness and joy in the New Year! We make them every year, too. I love them so because they start to form their structures so quickly! In just a few hours the molecules are lining up. love that! 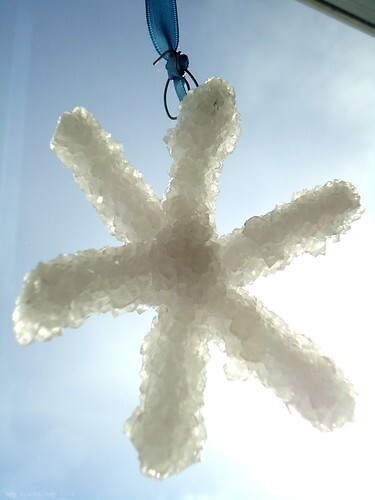 Funny - we used up the last half of our box of borax on snowflakes a few weeks ago, and then I needed 2 tsp for my cleaners... didn't have any! Sent Eric to the store to get a box, and they were out! !! Could it be that that many others were making snowflakes!? :0 I dunno. A mystery.